It often feels like the spring and fall seasons don’t last very long in Houston, sandwiched between a long summer and a somewhat shorter winter. 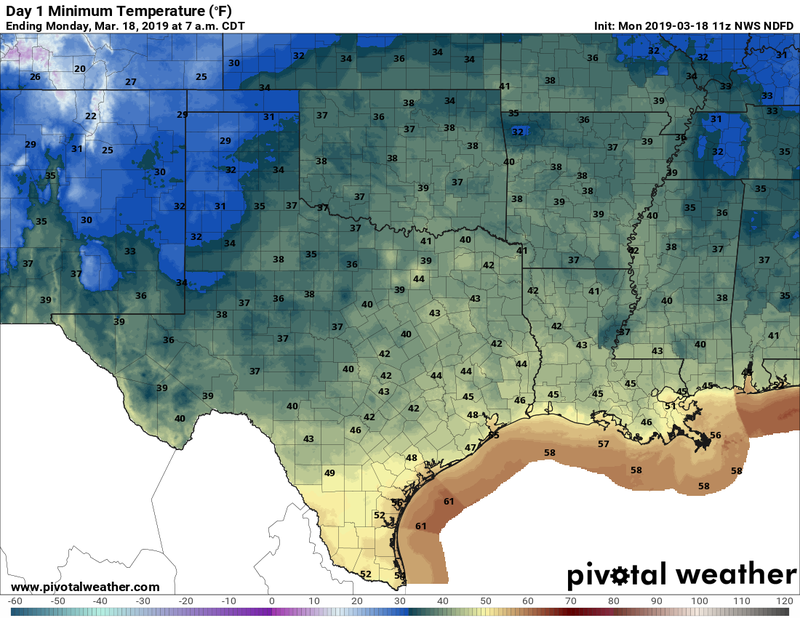 This week, therefore, will offer something of a rarity—a long stretch of nearly perfect spring weather in Houston. The only shame is that most kids had spring break last week, rather than during this week’s idyllic conditions. Some sunshine broke through on Sunday, but it was still a mostly cloudy day, and we expect similar conditions today due to a more southerly flow higher in the atmosphere, which is bringing some mid- and high-level clouds in the atmosphere. After a cool start in the upper 40s this morning, highs this afternoon should reach near 70 degrees. The city of Deer Park has lifted its Shelter-in-Place restrictions this morning, but Deep Park Independent School District campuses will be closed. There’s not much to say about the mid-week weather as high pressure dominates. We should generally see nighttime temperatures in the low 50s for Houston, a bit cooler inland and a bit warmer near the coast. Daytime highs will be in the low 70s. And yes, skies should be mostly sunny, with fairly dry air. Oh my. This will be a bit of a transition day, as high pressure moves off, and the onshore flow resumes. I think we’re still likely to see a mostly sunny day, with highs in the low- to mid-70s, however, and rain chances will be fairly low. Temperatures this weekend should be warmer in response to the more southerly flow, in the 70s and perhaps 80s on Sunday. 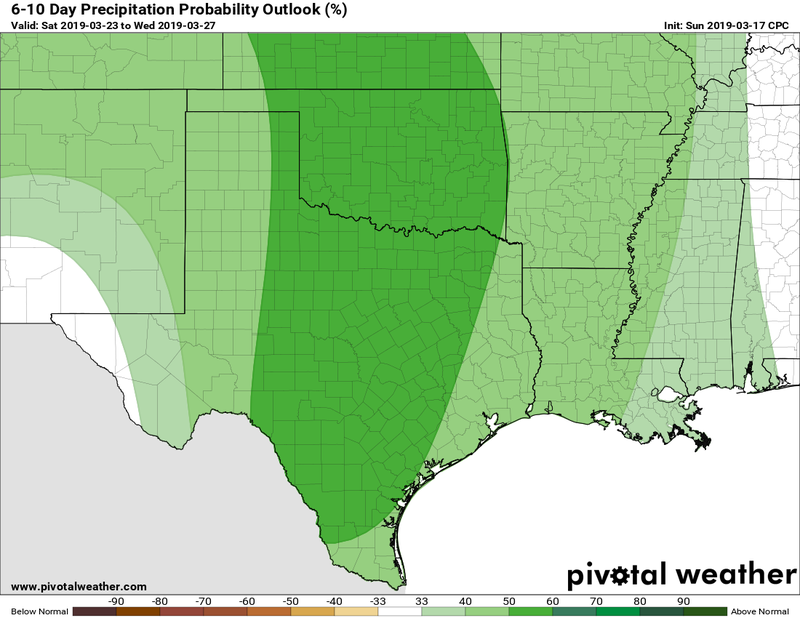 This moisture return, combined with an upper-level low pressure system coming in from the west, will lead to better rain chances, especially Saturday afternoon, overnight, and Sunday. Accumulations don’t look all that great at this time, perhaps around 1 inch or so, but it’s hard to have much confidence this far out. In any case, after our sunny and pleasant week, the weekend should be less so. The early part of next week looks fairly warm, with ongoing shower potential, before the models diverge as to whether another cold front makes it through. Should we be worried about air quality from the Deer Park fires – especially once the winds shift later today and bring the smoke into higher populated areas like Pearland and Fort Bend County? ANYTIME, there are carcinogens in the air, you should be worried. Here in the Galeria area, seems like you could smell something in the air. I took a pic from up the 7th floor looking east, as you could see the source of the smoke way out on the horizon, and it was spreading up and over the sky overhead. The fire will simply have to burn out. I Heard at work today that their firewater system failed – probably emptied the firewater tanks. Also, you can’t overfill the berms or you have an even bigger loss of containment event. Amazing that there have been no injuries thus far. It will be interesting to see the results of the CSB investigation later this year. I could’ve sworn I saw storm clouds to the south this morning, tuns out it was smoke. I could see it all the way from Tomball! Any predictions on what the first weekend of April is going to look like? Planning an outdoor birthday party. Sir I really enjoyed listening to the show on Texas matters last week it was very informative. Deep Park? Isn’t he that goofy doctor from India? Anyway, let’s enjoy this last week of cool weather before the hot muggies hit in about six weeks. The weather will be lovely, aside from that pesky Airborne Toxic Event! This forecast (and probably cancer) brought to you by your friendly neighborhood energy company. What are the winds doing this week? The deer park fire cause the sun to disappear again this afternoon behind the smog … looks like this perfect spring weather will be ruined by this fire. And yes I will go on a tangent about this, they had been fined for multiple violations in the past but looking at the amounts, the fines are ridiculously low. No wonder that non-compliance + paying the fines is much cheaper than doing the right thing. These fines should be 10 times as high. ITC is a private subsidiary of a Japanese conglomerate (Mitsui & Company) and as such it’s not easy to find financial information for ITC, but Mitsui is publicly traded in Japan, and they did $43 BILLION in revenue last year (if I’m converting from Yen to dollars correctly. $18,000 is like 0.0000004% of their annual revenue. The wouldn’t even need to look in their couch cushions to pay that.